Grimeca are a well known wheel manufacturer of motorbike and moped wheels. 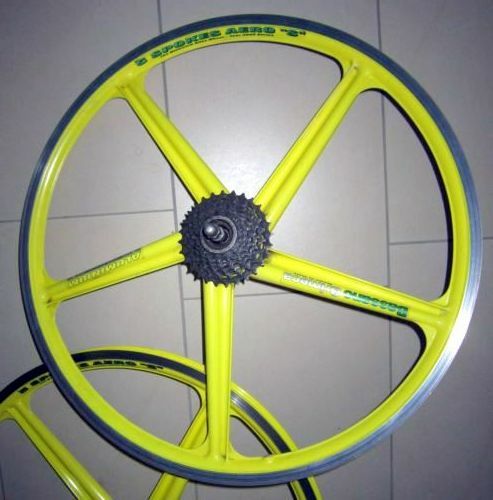 Unsurprisingly, this wheelset looks like one that you would expect on a scrambler or a street racer. The Bassano name was used on three wheelsets, this one the 3 Razze Avio ("Aviation Racing") and the 6 Razze Avio, which have 3 and 6 spokes, rather than 5. The "(S)" refers to the shape of the spokes, which are s-shaped in cross section. Both these wheelsets came as both rim braking (shown) and disc braking. They came in a huge range of colours (from brushed bare aluminium, through yellow, red, black, blue to lurid greens and worryingly atomic orange). The paint work looks like the wheel was dipped painted but it could be factory sprayed or powder coated. Being one-piece wheels, bearing servicing is hard and truing is almost impossible (without a frame and a hammer). These are seriously heavy wheels. There are a small number of design flaws in the manufacture of these wheels: their weight being a significant one. However, the worst design issue is that the rims use a single chamber deep well, which is partially filled with a rubber d-section, solid rim-tape with a special valve-hole fitting. These regularly fail, ripping the inner tube apart. This is fairly easy to overcome by using insulation tape to prevent the edges of the rubber tearing the inner tube.